Before the Rain brought a vision of “Balkan conflict” to the world that caused a sensation in the mid-1990s, winning the Golden Lion in Venice and an Academy Award nomination. Five years of increasingly horrific news from the former Yugoslavia, with fierce fighting and massacres in Croatia and Bosnia, made Milcho Manchevski’s searing yet lyrical film timely to a degree that few filmmakers have ever achieved. But this is far from a documentary treatment of Balkan violence, and the country that Manchevski put on the map—his native Macedonia—was in fact the only Balkan state at that time not to have been engulfed by war or ethnic conflict. Manchevski had not set out to explain the devastating sequence of events that started in 1991, as federal Yugoslavia dissolved during the year that saw the Soviet Union itself fall apart. Having grown up in Skopje, he finished his film education in the United States, where he began to make a reputation in music videos during the eighties. And the arresting images and teasing dramatic structure of Before the Rain draw something from this experience. But if Manchevski belongs to the generation of filmmakers who have grown up with the pop poetry of music videos as part of their natural vocabulary, his other inspiration is surely the western—an impression confirmed by his equally ambitious second feature, Dust (2001). 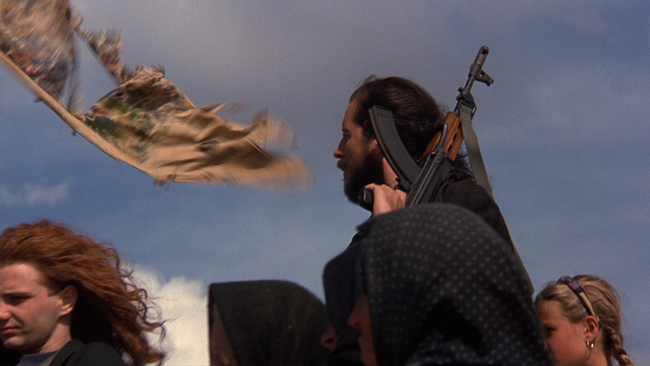 Think of the westerns of Sam Peckinpah, elegiac tributes to a way of life being crushed by modernity. Or of Sergio Leone, whose films were once contemptuously known as “spaghetti westerns” but were actually baroque variations on the great American western tradition, and influenced postsixties filmmakers everywhere. Peckinpah and Leone dealt in myth rather than history, and weren’t afraid to use extreme violence for both artistic and realistic effect. The violence that rips through Before the Rain, on Macedonian hillsides and in a London restaurant, draws on such mentors for its impact. And when Manchevski insists that his film is not “about” Macedonia, or even just the Balkans, he’s surely aspiring to that same universality of late, great westerns such as Once Upon a Time in the West or The Wild Bunch. The figure that his hero, Aleksandar, cuts is already a romantic one in London but becomes very definitely a westerner back in Macedonia, as he returns to his old village, only to be immediately confronted by a gun-toting youngster. The specifics in the film are carefully balanced, not to provoke a cynical response (“more Balkan mayhem”) but to make clear that this is an endless, cyclical process, as Muslim blames Christian and so provokes retaliation by Christian. The two armed gangs we meet in the film’s first part, both with their trigger-happy gunmen, are indeed equivalents, though one claims to be avenging Christian Macedonian honor and the other Muslim Albanian values. But we should be clear that neither is meant to be typical of modern Macedonians, of the kind we see briefly when Aleksandar arrives in Skopje, any more than they’re typical of the idealists and opportunists everywhere that we call terrorists today. Terrorism was certainly on Europe’s agenda when Manchevski first wrote his outline for the film in 1991, after paying a return visit to Macedonia. But bombs, assassinations, and kidnappings were then more common in Britain, Italy, and Germany, as we’re reminded by the radio news Anne listens to in her photo-agency office during the London episode. Irish republican bomb alerts were almost routine in England from the seventies to the end of the nineties, which lends authenticity and poignancy to her parting with Aleksandar in a London cemetery. He’s leaving her in a London under terrorist threat to go back to “peaceful” Macedonia. What is so striking about Manchevski’s circular form, like a Borges story or an Alain Resnais film, is that Anne is effectively seeing images from the future on her London light box. This is a world linked by violence: much of it mediated by photography and news but all of it potentially local and bloody, as both protagonists will discover so brutally. It was no doubt the sense that Manchevski could tell a truly European story, rather than merely a Balkan one, that engaged his supporters. Simon Perry, the producer of more than a dozen outstanding European films while heading the state investor British Screen, became a moving force behind the film; and Britain’s European Co-production Fund also contributed, as did French producers and the Ministry of Culture of the still young Republic of Macedonia. For two decades, European governments and cross-border bodies have been wrestling with the problem of linking their individual film industries to become more effective and to tell stories that show the reality of a continent where London and Skopje are only a few hours apart, with people constantly traveling between them. Before the Rain led the way for other midnineties films that managed to do this, such as Ken Loach’s Land and Freedom (1995) and Lars von Trier’s Breaking the Waves (1996). All three of these were considerable box office as well as festival and critical successes in a number of countries. And all told tough, emotionally complex stories embedded in their landscapes and characters’ histories. Yet all were shot on shoestring budgets patiently assembled from diverse sources. And Before the Rain nearly suffered the kind of last-minute disaster that is a familiar feature of European filmmaking, when one of its original backers, Channel Four Television, pulled out, leaving British Screen to save the production. One figure common to von Trier’s breakthrough film and to Before the Rain is Katrin Cartlidge, who died suddenly, at the age of forty-one, in 2002. After getting her start in television soap opera and comedy, Cartlidge emerged in the early nineties as a striking and courageous actor. She made her debut in Mike Leigh’s Cannes winner Naked (1993), playing a spaced-out addict in this bleak comedy of modern manners, then became the poster image for Manchevski’s film, before going on to star in two further Leigh improvisations, Career Girls (1997) and Topsy-Turvy (1999). She returned to the Balkans in Danis Tanovic’s No Man’s Land (2001), set during the Bosnia-Herzegovina conflict, playing a reporter. Cartlidge was never glamorous in any conventional way, but she brought presence and conviction to all her roles in a tragically short career. In Before the Rain, she manages to bridge the gulf between contemporary London and “timeless” Macedonia, between a modern career woman juggling job and relationships and a statuesque mourning figure in an antique landscape. Rade Serbedzija, a distinguished Croatian stage actor and star of Yugoslav cinema and television, does the same, in reverse. He had lived in exile like the photojournalist he plays, an exotic figure in the film’s central London sequence, before he returns to Macedonia and tries to pick up the threads of his old life in a community that is now murderously polarized. Aleksandar dies trying to rescue the Muslim girl we have seen at the beginning of the film, when she is protected by an innocent young monk, Aleksandar’s nephew, touchingly played by the rising French actor Grégoire Colin. Serbedzija’s own life has echoed his role in the film, as he has worked for peace and reconciliation in Bosnia, acting with Vanessa Redgrave in Sarajevo, while also pursuing a successful career in Hollywood cinema. Before the Rain brought a certain image of the Balkans to a large audience, and launched both Macedonia and Manchevski on the world stage—as well as being the first film shot (partly) in Macedonian to be widely seen internationally. But with more than ten years of hindsight, we might wonder if its success was as much due to its timeliness as to its intrinsic qualities. I had the unusual experience of taking part in an international seminar devoted to the film, held in Florence in 1999, at which experts in many aspects of its background and context spoke over two days. The fact that the film could sustain such detailed discussion was already noteworthy. But what also emerged was how well Manchevski’s desire to create something that was not reportage or history or a political analysis had succeeded in leaving the film open to different interpretations. For me, its use of landscape was especially intriguing. I only learned later how much Manchevski had actually created the landscape we might take to be typical Macedonia, patching up roads to inaccessible places and bringing together very different spaces to create a composite, as in the monastery around which the first episode is set. But what matters is not its authenticity as a place; rather it is the image of an apparently timeless pastoral landscape, as a contrast with a London that is, in reality, just as historic—and how he creates links, especially through the churches and cemeteries we see in both and through the graphic war photographs Anne is looking at in London while Aleksandar is back where the images have originated. Perhaps the film’s greatest achievement is to address our images of certain kinds of places, and the stories we expect to find there, and to disrupt these by showing how they are connected and have implications for each other. Just as much as a classical landscape painting by Nicolas Poussin or a grainy war photograph by Don McCullin, Before the Rain is a film about images and how we relate to them—whether we take them seriously or regard them as merely picturesque. An image is an object, like the stained picture of Madonna we see, but it is also a link with another reality. This is a theme that Manchevski has since returned to, more explicitly, in Dust, but in Before the Rain he has made an important and, I suspect, classic statement—a film about images that may be properly mentioned in the same sentence as Chris Marker’s La Jetée and Michelangelo Antonioni’s Blow-Up. He has also told a heartrending story of loss and brutalization, of the price that is paid daily wherever men take up guns to assert their identity, and especially the price that is paid by women caught up in such power struggles (it is the daughter of Aleksandar’s youthful love, Hana, whom he tries unsuccessfully to save in this intricately plotted allegory of tribalism resurgent). Fatefully, the film is bracketed by predictions of rain that is overdue and coming. We might wonder if it is Bob Dylan’s “hard rain,” as Aleksandar jokingly suggests in London, or a Europe After the Rain, as in Max Ernst’s great surrealist picture, painted in America during the Second World War, in which he shows a barren landscape nearly devoid of life. The almost intolerably beautiful, yet bloodstained, landscape of Before the Rain invites us to consider just where we stand on the future of “European civilization.” Will it be the old tribal values, or new ones of tolerance and humanity?